FN America, LLC is pleased to announce the release of the FN 509 MRD pistol, an optics-ready duty pistol designed specifically for agencies considering miniature red dot optic-equipped pistols for their officers. 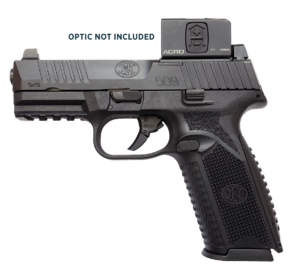 The FN 509 MRD pistol features the company’s patent-pending FN Low-Profile Optics-Mounting System, first introduced on the FN 509 Tactical. The optics-mounting system can accept more than ten commercially available miniature red dot optics, including the duty-grade Trijicon RMR, Leupold DeltaPoint Pro, and the recently released Aimpoint ACRO P-1. The 509 MRD is a striker fired 9mm pistol with internal passive safeties and no external manual safety. Price: Law enforcement agency quote only. The FN 509 MRD joins the FN 509 law enforcement-specific line-up alongside the new Training and Simunition pistols released last year. Agencies interested in the FN 509 MRD should contact le@fnamerica.com for a price quote.